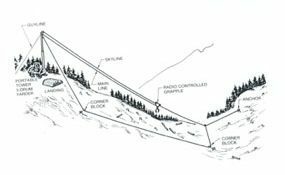 Although ground skidding of the logs is one of the most important processes during timber harvesting, it is not efficient and effective in harvesting sites where the slopes are steep. Cable yarding is the most efficient way to harvest the logs in such cases. 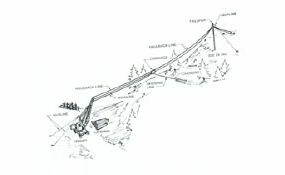 This fact sheet introduces two basic systems of cable yarding for timber harvesting operation. Cable yarding transports the logs employing stationary or mobile yarder. A cable system lifts the logs vertically, therefore contact between the logs and topsoil can be minimized in contrast to a ground skidding system. There are two primary types of cable yarding system, the highlead and the skyline system. The highlead developed by Finnish forester Oscar Wirkkla is the most practical and the least expensive cable yarding system. It is widely used for clearcut harvesting. It has two lines: the main line and the haulback line, which are connected to each other by buttrigging consisting of short chain and several chockers. One end of the buttrigging is attached to haulbackline, while the other is connected to the main line. Two drums located on the stationary yarder are driven in opposite direction of each other so when the mainline is rewound, the haulback line is released to move the logs attached to the chokers from the downhill to uphill. Figure 1 illustrates a typical highlead cable yarding sytem. The skyline system is more sophisticated and expensive as compared to the highlead cable yarding. A wire rope is suspended between two or more points in the system, and a carriage attached to the mainline moves on the skyline by pulling the mainline. In some systems the carriage also can be monitored by remote control moved up and down on the skyline. Running skyline system is a more advanced system. 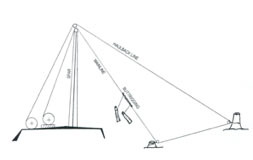 It has at least three drums to control overall operation and a line that can be extended to retrieve high-value logs located in a distance place in the field. Figures 2 and 3 depict skyline and running skyline cable yarding systems, respectively. Several parameters including the span, distance between two supports, loaded midpoint, horizontal distance and chord are important engineering aspects to be considered for an efficient operation of the system. Based on these parameters, percent deflection and slope of span also can be calculated using the following equations. Figure 4 illustrates main parameters in a typical skyline cable system. Figure 1. Highland cable yarding system. Figure 3. Running skyline system. Figure 4. Parameters in skyline system.